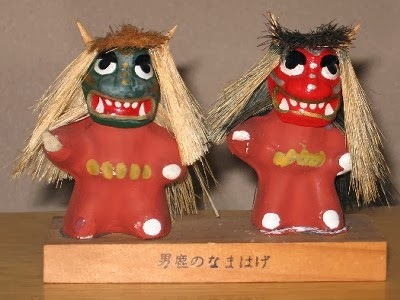 The capital of the prefecture is Akita 秋田.
. Namahage なまはげ　Demons from Oga Hanto . 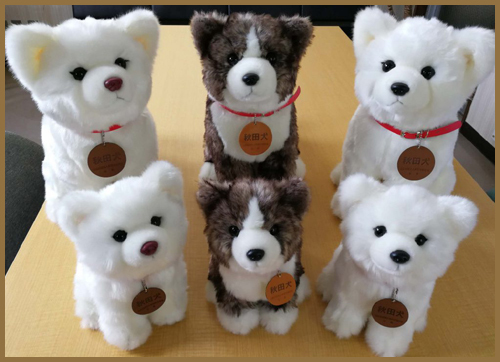 The Akita (秋田犬 Akita-inu) is a medium breed of dog originating from the mountainous regions of northern Japan.
. Akita no Kokeshi 秋田のこけし .
. Akitasugi oke taru 秋田杉桶樽 Akita Cedar Cooperage . They have a long tradtion. 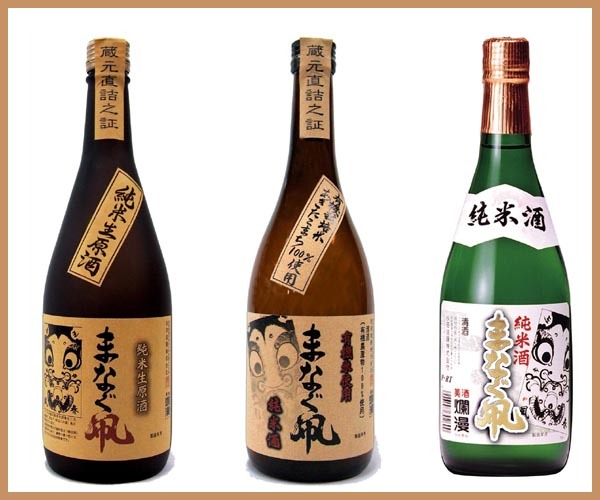 It is said Sakanoue Tamuramaro used them during the fights with the Emishi in Tohoku. The kite was a sign for the harbour, seen by ships far away. 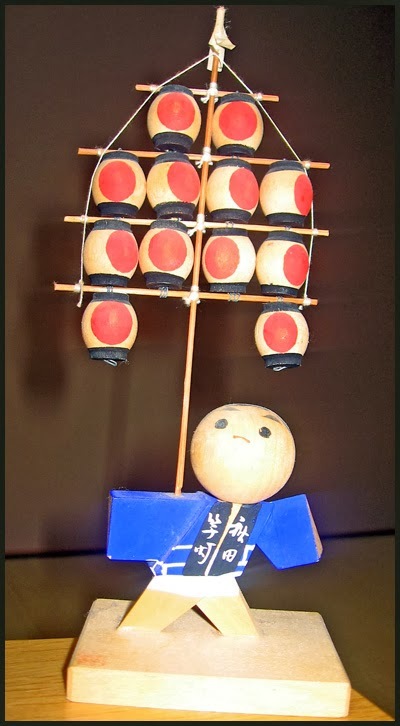 During the Edo period, they became "fighting kites" in competitions. 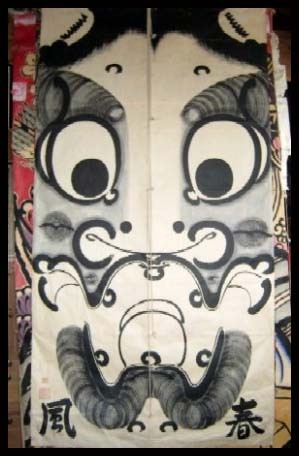 managu tako まなぐ凧 "kite with big eyes"
painted only with black Chinese ink. 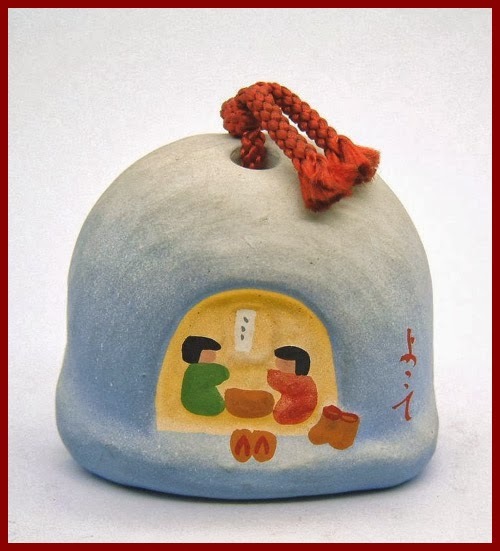 managu is the local dialect for manako 目玉 eyeball.
. magewappa まげわっぱ / 曲げわっぱ Bento Boxes . Tassels hanging from three places characterize Honjo Goten-Mari (palace balls), designed with vivid colors and patterns. 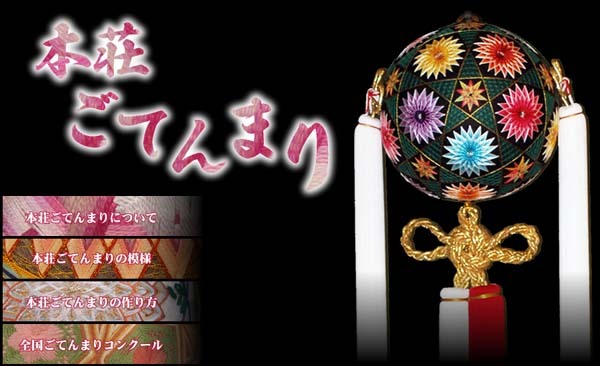 In November, a national competition of "goten-mari” is held in the city. 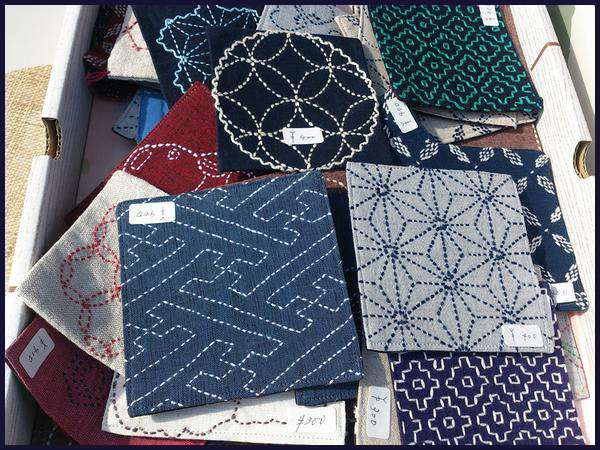 “Sashiko”was originally intended to make fabric stronger and for its extra insulation. However, these days, its practicality and beauty go together after being handed down from generation to generation. 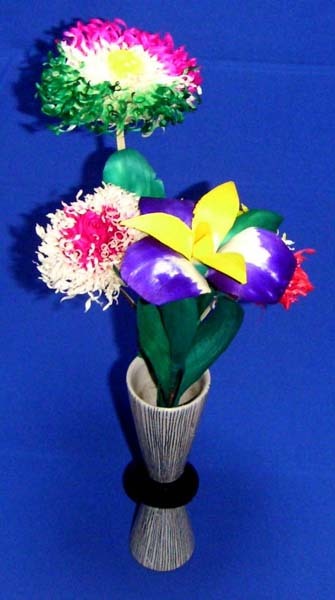 "Kumiko zaiku” (rounded cubic works), made of thousands of “kiriko” (rounded wooden cubes), is an assembly of elaborate skills. It takes ten years for a craftsman to learn making a finished piece of work.
. kantoo 竿燈 "lantern on a pole"
Once made by Kikuzawa Toozoo 菊沢陶蔵 Kikuzawa Tozo in Arakawa 荒川, near lake Towada. 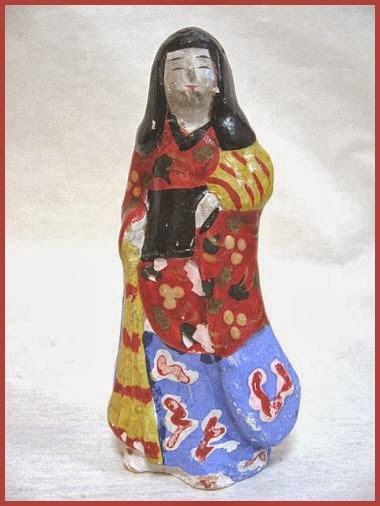 They are rather simple in their charming ways.
. - Kintaro 金太郎 "The Golden Boy"　Kintoki 金時 .
. oiran 花魁 geisha dolls - Nakayama and Yabase . Kakunodate 角館町, Kumoshikari District, Kakunodate, Senboku City. Made with stripes of bark torn from the Itaya maple tree. The stripes are woven together for items of daily use. When used for a long time, they change color and become beautiful amber color. "It is the customer who creates the art". 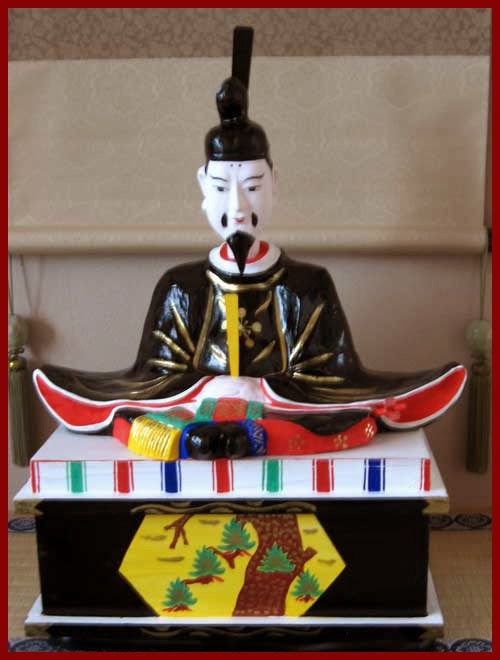 Itaya craft is one of Akita prefecture designated traditional crafts, which is made in Kumoshikari District, Kakunodate Town, Semboku City. Their characteristics are lightness, strength, and their color, which will gradually change to beautiful amber over time. Itaya Kaede (mono maple) is used in the shape of strip and is woven into products by hand. 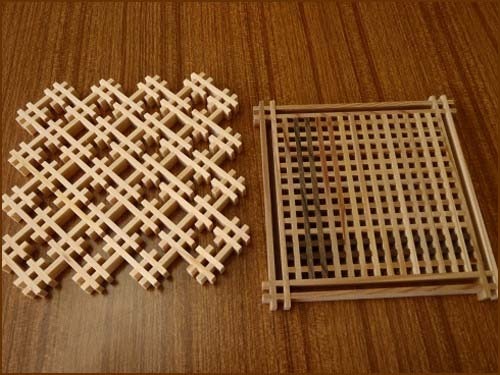 Applying the technique of basket making, products like trays, Tsuzura (box for clothes) and screens are also made and further development of new products are expected. At this moment, they have developed products made of other materials such as walnut, wild vine, and soil dyed mono maple, which are gaining good reputation. The process can be divided into 2 parts. One is making narrow strips from raw wood and the other is weaving. they slit the material into narrow strips. Their thickness will be less than a millimeter. The careful work of experienced craftsmen will make them into pliant strips with the same width and thickness suitable to each product. the strips will be woven into products by hand. Mi (an agricultural implement used for threshing) and baskets have been the common products of Itaya craft and they have been commonly used from old times as daily necessities. There are several opinions about its origin, but it seems to have developed from farmers' side job in the winter agricultural off-season. The district has abounded with materials and been close to consumers in the city. This environment helped Itaya craft flourish. 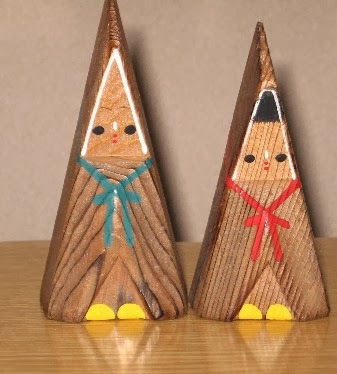 It is believed that the term originally came from the association of white birch or "白樺" with homes in good standing. 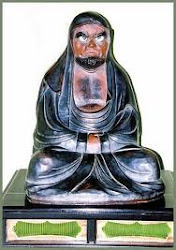 Thus 樺 may have described the class of artisans rather than the actual materials used. Kabazaiku in Kakunodate is said to have started when 藤村彦六　Fujimura Hikoroku, a retainer of the Satake (samurai) family which ruled the city during the 1780s, brought in the techniques from the Ani area (current Kita Akita city). Since then, it became a side job of low-class samurai who were taught by the Satake family. both of which require extracting mountain cherry bark, drying, cleaning and making it uniform. 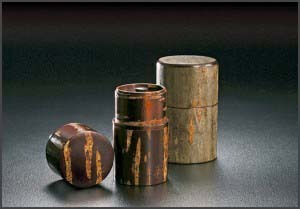 When “molding,” the cherry bark gets glued to a mold with an adhesive called nikawa, and the mold is removed after is has dried out. In the “wood-base,” style, the already processed cherry bark (with nikawa) gets attached to the product itself, and is then “coated” with kabazaiku, so to speak, using a small metal trowel that has been heated over a fire. 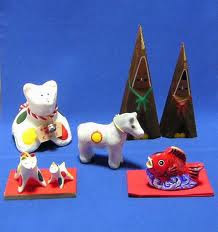 Each piece of cherry bark needs to fit the shape of the product, making it extremely time-consuming to complete the process.
. oshi-e bina 押し絵雛 hina dolls from raised cloth technique .
. komadaki dooji 駒抱き童子 child holding a horse. 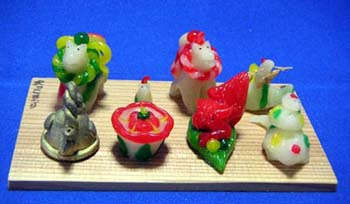 shinko is a powder made from new rice, that can be mixed with water to form a dough in the form of animals or flowers. When it is hardened, you can add edible colors for decoration. 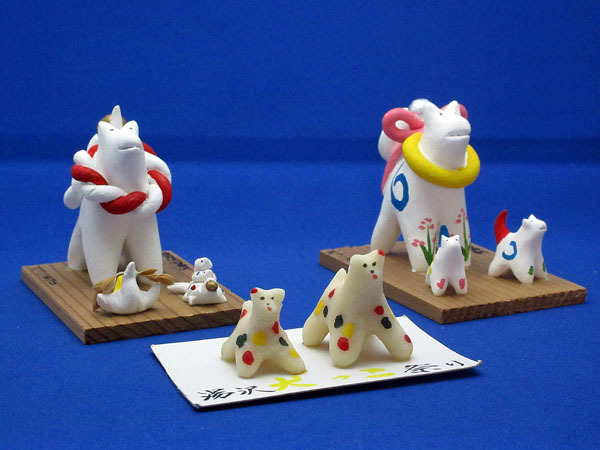 The Dog figures are made for the New Year celebrations on January 15, when dogs are honored. (inukko matsuri 犬っ子まつり). Once upon a time, dogs helped drive out a band of robbers from the village. So people build small snow caves and put these animals in there to protect their homes from robbers. 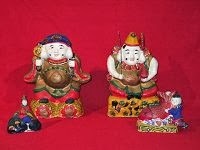 Lately they are only made by one old craftsman, Satoo Masamitsu 佐藤雅三. 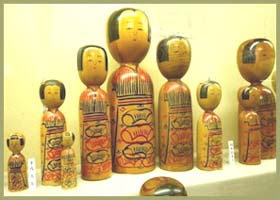 The clay dolls were made under the influence from Fushimi dolls, brought by merchants on the Kitamaebune 北前舟 trade ships, around 1789 - 1817). 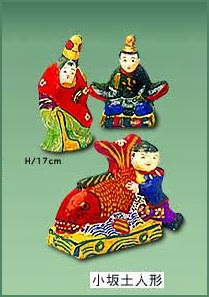 There were quite a few craftsmen producing them at that time, but in the mid-Meiji period, they became almost extinct. 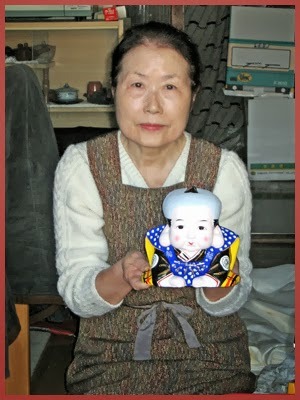 When 高松茂子 died in the first year of Heisei, that was the end. 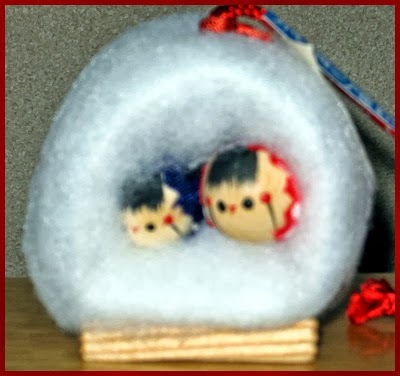 Now only Michikawa Tomo 道川トモ is left to make them. 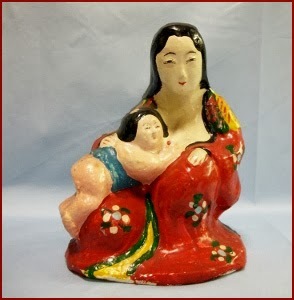 Older dolls were made with the basic colors of green and red, since Meiji other colors were also used. Yabase Tenjin 八橋の天神 Tenjin from Yabase is very popular. 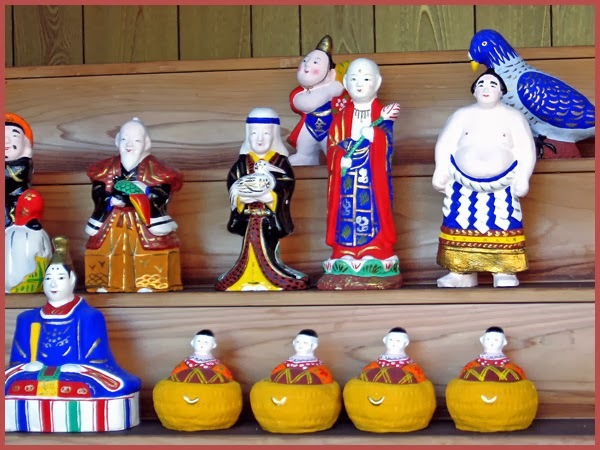 He comes on various goods, from Tee shirts to tea mugs.
. Yuzawa Daruma Onsen 湯沢のだるま温泉 Hot Spring .
. Akita Folk Toys - this BLOG .